Nature Connect partners with the City of Kitchener to offer Kitchener Forest School and outdoor experiential programs for children and families. Our programs are offered on the traditional lands of the Neutral, Anishnaabe, and Haudenosaunee peoples. ﻿From storytelling to orienteering, artwork to games, your child will be engaged in a style of education that nurtures children's natural curiosity and questions. 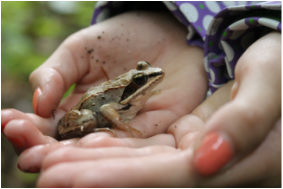 Curious about Kitchener Forest School programs? Learn more about this movement that grows out of an ﻿emergent, inquiry-based model of education through our blog. Follow us on Instagram @kitchenerforestschool. Teachers! Looking for a unique tool to encourage outdoor play and support your math and science programs? Get some Stick-lets, a unique tool/toy for kids of all ages.